Mitt Romney’s hate fest this morning bashing Trump got me thinking about why the GOP leadership asked him to do so very publicly. It’s sickening and hilarious watching the absolute desperation that the leadership of the Republican Party is exhibiting this primary season. The two top candidates running on their ticket are both “outsiders” and not under the direct control of the corrupt apparatus running the velvet coup in D.C. While the leadership of the GOP has steadfastly REFUSED to attack Obama, his lawless and unconstitutional actions, the Democrats or their agenda – it’s been an amazing thing to watch all their efforts and rage being brought to bear upon fellow Republicans Trump and Cruz who are not on their leash that threaten their Fascist gravy train. You certainly did not hear THIS kind of vitriol being leveled against Hillary over her e-mails, or Obama over the IRS scandal did you? ALSO – ROMNEY NEVER – EVER – TALKED ABOUT OBAMA OR ANY DEMOCRAT THE WAY HE BASHED TRUMP TODAY. NEVER. Not in 2012, and not since his failed run. It’s become very clear to us ‘little people’ in flyover country that the Uniparty Establishment despises us and that the GOP leadership looks at us plebes merely as tampons to use and discard once we get them into office. That we will no longer bow down and take it up main street has earned us their hatred and contempt. So the Oligarchy has decided to play hard ball with us “children throwing a temper tantrum”. Which leads me to my question: why foist the liberal establishment LOSER of the 2012 Presidential election, Mitt Romney into holding a PRESS CONFERENCE to bash Trump after he received Trump’s endorsement 4 years ago? Does the Establishment really think having the poster-boy of the feckless GOP Ruling Class Leadership give Trump and all his millions of supporters the middle finger going to sway any of them over to supporting Rubio or Kasich? NO. They are setting the stage, greasing the skids for what they plan to do should Trump or Cruz “win” the nomination. Romney’s bash of Trump this morning is intended to do only one thing: place in the minds of the public, the EXCUSE the Ruling Class will use to either foist their own candidate upon the party at a contested GOP convention (which is why Rubio and Kasich are not going to get out of this race), or why they will throw their support behind Hillary Clinton. As my readers know, I have my major issues with Trump – moreso the mentality of the people who see him or any politician as a political savior. But what is become clear to me is that the Oligarchy in DC is telling us that we the little people will not be allowed to have OUR CHOICE for the White House in power. They instead will force their candidate upon the people by any means they can conjure. They are going to TELL US whom they will give us as a weak candidate to lose to Hillary so that the crowning of the next Marxist Dear Leader creates the illusion that our election system has any legitimacy. And their corrupt Fascist gravy train and growth into a hard tyranny will continue unabated. 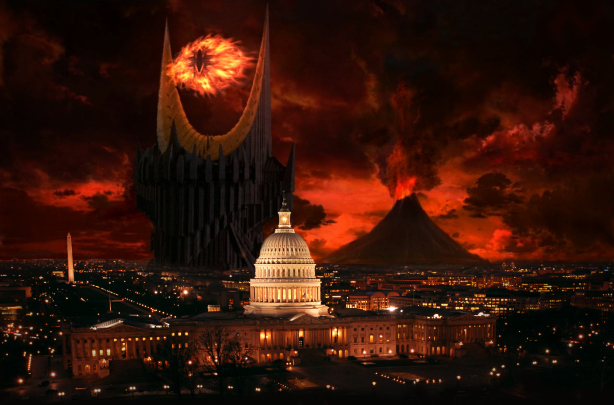 Mordor-On-The-Potomac (aka: Washington D.C.) is nothing more than a corrupt Beast, having usurped the Constitution and pursuing policies and plans that are reducing us under absolute Despotism. Why do we continue to allow ourselves to be conquered by this evil? When will Americans wake up and realize that the Federal Beast has no legitimate moral authority over us? Rather all it has is guns they put to our heads while they practice lawlessness and flaunt their tyranny in our faces. 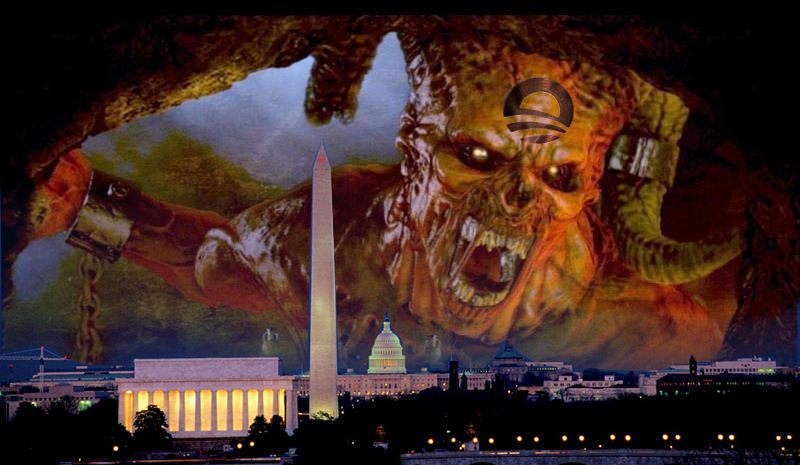 Like ObamaCare – everything in Washington is done in secret, behind closed doors, like the Old Soviet Union. The Ruling Class twists the arms of our supposed Representatives to vote for bills NONE OF THEM HAVE READ. They sabotage anyone not in lockstep with their agenda of empowering the Beast, and select rulers from among themselves so as to silence the voice of this people. No appropriate time is even given to read and study all these omnibus spending bills, regulatory bills and other such institutions of despotism being imposed on us. 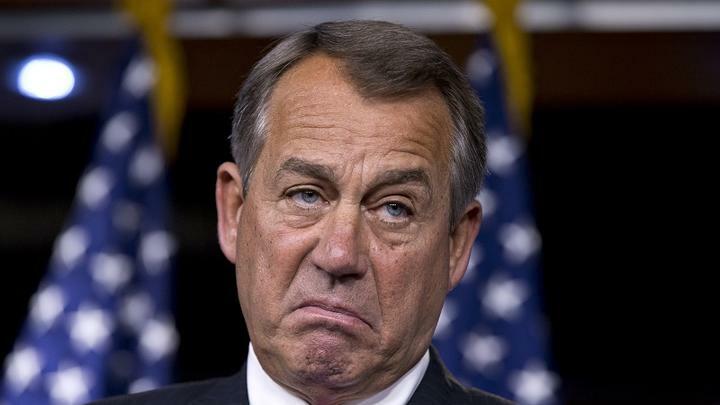 So Boehner hands Obama’s dictatorship another year after his term is supposedly up, funds everything Obama wants and eliminates the federal spending cap for the next 2 years, meaning Washington can spend whatever it wants on whatever it wants. Ask yourself – if you are broke, can you call your credit card company and demand they raise your credit limit so you can spend tenfold more than your current overdue balance is ? Can you tell your credit card company that you also will defer all payments for the next few years? Then, after making these demands, you THREATEN them with non-payment if they do not do as you request? You think you can get away with that? The American Federal Government just did this. And is getting away with it – to the absolute ruin of your children and grandchildren. The entire Federal Government is CONSIGNING us and our progeny to unimaginable ruin, poverty and destruction. A Congenital Liar that is responsible for killing Americans, enriching herself off the people, selling her office for donations while pursuing more power, are absolved from all their wrongdoing by grant from the Praetorian Pravda Media. Joe Sixpack Businessman would rot in prison for even a minor infraction such as not backing up his e-mails much less setting up a secret server trading classified documents over the internet. But Hillary is absolved. Because in this new Despotism, some animals are more equal than others. Heads of agencies, using their office to attack, punish and eradicate political opposition after erasing the evidence of their treason against the American people, are exonerated and given cushy pensions we pay for. 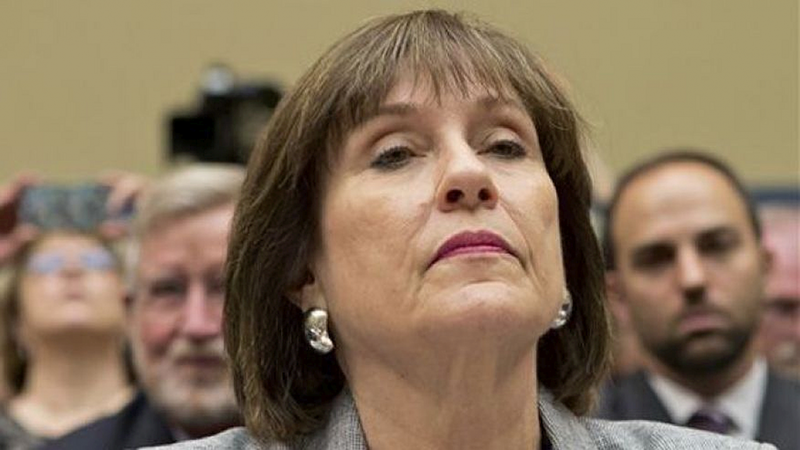 Using the IRS to harass, punish and abolish Conservative and Christian groups is now an institution that is permissible under the Beast that rules us. So exactly why do we Americans allow ourselves to be subjugated by this evil tyranny? What more evidence do we need to understand that the entirety of the Federal Government is wholly illegitimate? From the Executive Branch, to the Legislative and Judicial branches, they have all demonstrated that they will usurp, violate, abolish by decree – and ignore THE CONSTITUTION OF THE UNITED STATES when it suits them. They act OUTSIDE the bounds of the Constitution. They abolished the Separation of Powers. They have created a defacto dictatorship under the rule of oligarchs. They will not follow the Rule of Law, rather they decree that the rule of law is whatever they say it is. Then they declare that you ‘voted’ for this. 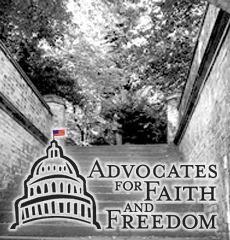 As such – the entirety of the Federal Government of the United States has no legitimate, moral authority under Heaven. Instead, it is become an institution of Satan – and wholly evil, despite supposed ‘citizens’ this people think they send to Mordor to represent them in matters of Justice. All this Beast in Washington has, are guns that it will put to your head to force your compliance with their edicts and tyranny. Or are you more willing to suffer, because this evil is sufferable, rather than abolish this form of tyranny to which you are accustomed? Chris Dorner’s Cop-killing Manifesto professes love for Obama, Joe Biden, Hillary, CNN, Gun Control and a litany of the MarxoFascist agenda – media scrubs it all. As usual with the Obama State-Media which preaches the narrative that TEA Party Conservative Americans are evil and need to be disarmed – the same media scrubs any and all references or mention that the 22 page screed from the deranged cop-killing vendetta of Chris Dorner is an Obama and MarxoFascist Acolyte. Sooppermexican does a great job to note the scrub and the exact things Obama’s Leftist media deliberately omit in their reporting of the incident which is already being used to further Obama’s disarmament agenda. 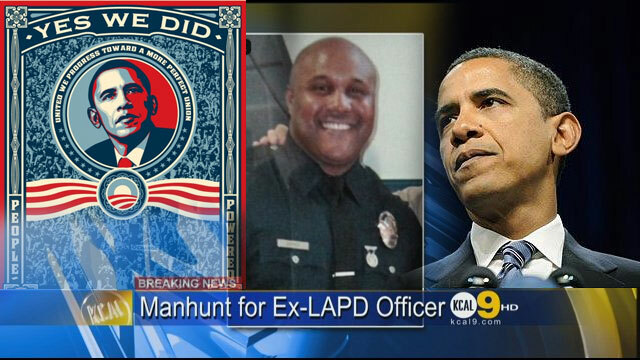 In the ORIGINAL manifesto authored by the cop-killing terrorist Dorner, he professes love and demands respect for Obama; he is anti-gun (dontcha love the irony? ); fan of Joe Biden; wants Hillary for 2016; fan of CNN/MSNBC; and supports the gay marriage and amnesty for illegals agenda. But you will never hear about any of this from the Obama media, because Dorner is simply a foot soldier of their agenda, gone AWOL and into assassination and terrorizing cops and potentially anyone who does not agree with his agenda. However, I was able to find a complete copy of the posting, from the website “Crime File News” – the details in it corroborate with the reading that Bill Handel gave on the KFI morning show today. So why did they edit it? Sen. Feinstein, you are doing the right thing in leading the re-institution of a national AWB. Never again should any public official state that their prayers and thoughts are with the family. Mr. Vice President, do your due diligence when formulating a concise and permanent national AWB plan. Future generations of Americans depend on your plan and advisement to the president. I’ve always been a fan of yours and consider you one of the few genuine and charismatic politicians. Willie Geist, you’re a talented and charismatic journalist. Stop with all the talk show shenanigans and get back to your core of reporting. Too bad Trayvon didn’t smash your skull completely open, Zim. He further praised Ellen Degeneres, H.W. Bush, Tim Tebow, and many hollywood actresses. He’s obviously disturbed. So should MSNBC and Obama be blamed for this murderous scum targeting cops and their families? NO – but if we applied the same standard that the media does conservatives and Republicans, then each of the people on this list contributed to the radicalization of a murderer who has taken 3 lives. And why did they edit all of this out? Would they do this for a Tea Party shooter? Somehow I doubt it. Emails to White House prove Obama was informed the Libyan Embassy Attack was the work of Jihadists TWO HOURS after attacks began. The lies began from the moment the 6 hour attack on the U.S. Consulate in Benghazi had claimed the lives of 4 Americans and continues in various forms right up to this moment. From the Outset – His Heinous Obama and his regime, thrust an obscure Youtube Video as the cause for two embassy attacks on the anniversary of 9-11. The Won has wavered little from that stance, ranting in the days and weeks after the attack about the video being the cause of a spontaneous riot whose blame was on free speech in America. The State Department had Hillary Clinton running television ads in Pakistan apologizing for the Youtube video and disavowing any government involvement with the video. Even during the debates, Obama tried to ‘school’ Romney that he acted on the information that he had available ‘at the time’, which up until now – Obama has asserted was the responsibility of the video that caused an unforeseen circumstance they had ‘no control over’. The suspicion of cover-up and lies by this entire regime on up to Obama himself has finally reached a point that Obama’s media cannot cover for him any longer. 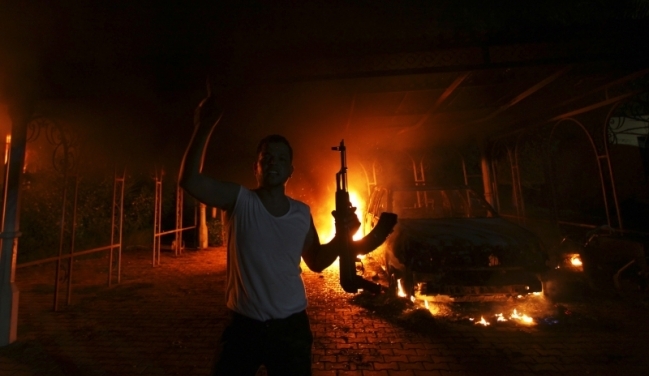 A set of internal emails have surfaced that declare that the group Ansar al Sharia claimed responsibility of the attack in Benghazi in real-time virtually as the raid played out on September 11th. Obama knew at minimum TWO HOURS after the attack began that it was an Al Qaeda-linked Jihadist attack on our embassy. So why did Obama let those Americans die? They were watching the attacks in real-time via a drone that hovered above the embassy, yet did not call in assets from anywhere to assist in saving the Ambassador and American staff. They watched this attack take place over the 7 hour siege. They let them die, then almost immediately – began blaming the video for the attacks. Obama strode out and THANKED the Libyans for doing the “right thing by taking the Ambassador to the hospital” when video and testimony suggest Stevens had been gang-raped, choked to death and then his body was dragged through the streets by thugs shouting ‘Allu Ackbar!”. This is beyond incompetence, it appears nearly deliberate, a sacrifice on the altar of militant Jihadists whom Obama backed in the overthrow of Libyan dictator Moammar Gaddafi. At minimum, the dereliction of duty from Obama on down through Hillary Clinton’s State Department should be cause for impeachment or resignation. At worst – this entire fiasco and cover-up story was for the purpose of Obama attempting to create a fictional narrative – citing the ‘video’ as a way to keep the attackers unawares of Obama’s hunt for them – and wala! ‘October Surprise’ attack on the Al Qaeda-linked group to bolster his sinking poll numbers and diffuse the scandal. Now the scandal breaks even wider and more pointed, depending on whether the rest of Obama’s media lackeys will continue to cover for him or try to salvage what little is left of their integrity as Fox News and others run with the story that Obama KNEW it was Jihadists within two hours of the six hour attack. Now we know what and when he knew it. The only thing left to guess is WHY he let it happen and WHY he lied about it – boldfaced for over a month. 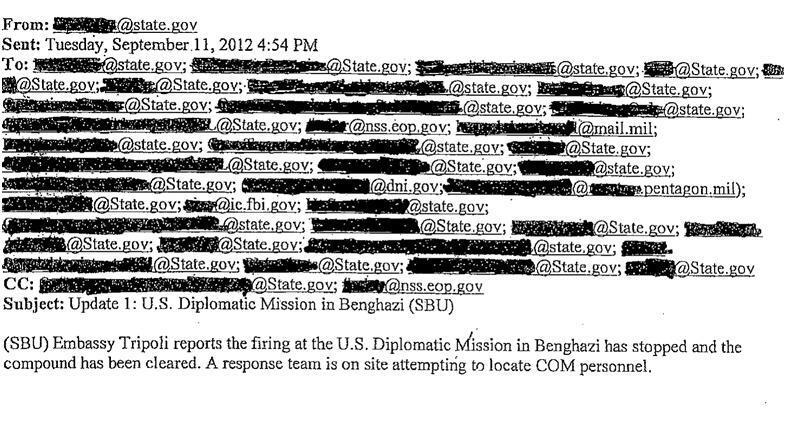 The redacted email address @nss.eop.gov is the White House Situation address. The email address extension @dni.gov is the an extension that goes to figures working under the Director of National Intelligence. It goes on to say “The Regional Security Officer reports the diplomatic mission is under attack. Embassy Tripoli reports approximately 20 armed people fired shots; explosions have been heard as well. 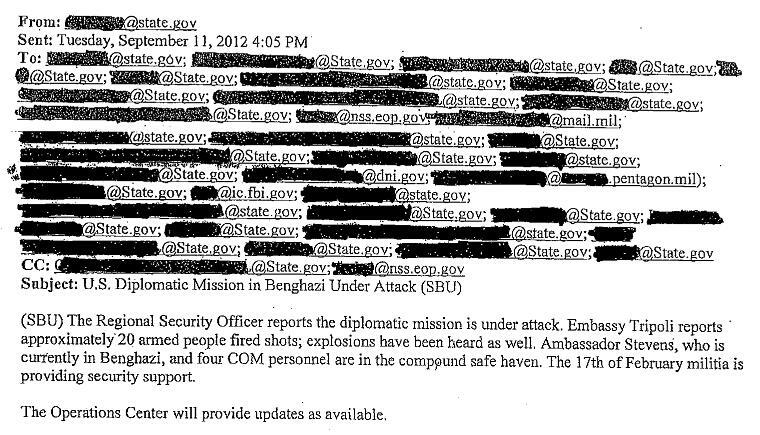 Ambassador Stevens, who is currently in Benghazi, and four COM personnel are in the compound safe haven. 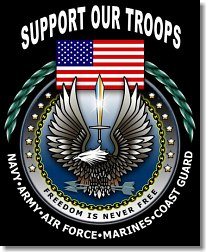 The 17th of February militia is providing security support. The second email came at 4:54 pm. The third email came at 6:07 pm and was sent to a different email list, but still includes the White House Situation room address. This is the link to the al Qaeda-affiliated organization. 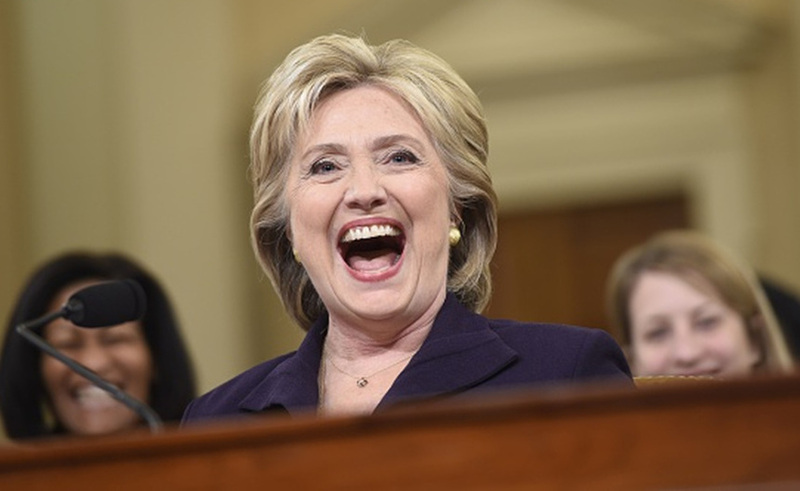 Hillary To Accept Veep Spot Under Obama Presidency?? Uhmmmmm….There is a great disturbance in the Force. Obama better find some wisdom. 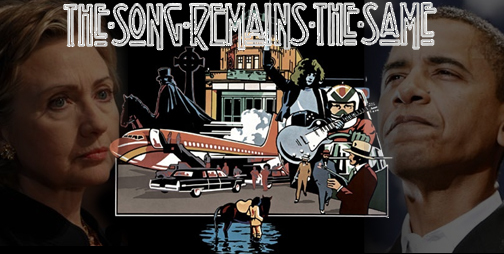 However enticing the proposition might be, the appearance of an unstoppable and unbeatable ticket might cost more than Obama would ordinarily be willing to accept if his reign as defacto king and messiah is only for a “limited time” – before a house intended for someone else lands on him in Oz – er, DC. I mean, Vince Fosterisms aside, I suppose there is nothing so tragic as a bizarre gardening accident or a self-inflicted gunshot wound to the back of one’s head before your corpse is found in a park. But then again, even Faust was willing to bargain with the Devil for a season of promised power, and Satan transforms himself into an Angel of Light…before turning into a hideous malevolent creature spewing lightning to destroy all who stand in the way. Before the official announcement of the First Marxist Empire, for a secure society with free healthcare. John scores an excellent analysis in his latest essay. Indeed, this political obsession with ‘change’ bodes ill for the republic and the only change I can document with certaintly in the last 15 years is the further erosion the republic into a Socialist Democracy. Our current crop of Presidential contenders promise more of the same “change”. This year we have had thirty state primaries–more than ever before—making it possible to take our campaign directly to the people of America: to homes and shopping centers, to factory shift lines and colleges, to beauty parlors and barbershops, to farmers’ markets and union halls. This has been a long and personal campaign—a humbling experience, reminding us that ultimate political influence rests not with the power brokers but with the people. This has been a time of tough debate on the important issues facing our country. This kind of debate is part of our tradition, and as Democrats we are heirs to a great tradition. Our country has lived through a time of torment. It is now a time for healing. We want to have faith again. We want to be proud again. We just want the truth again. It is the time to honor and strengthen our families and our neighborhoods and our diverse cultures and customs. We need a Democratic President and a Congress to work in harmony for a change, with mutual respect for a change. And next year we are going to have that new leadership. You can depend on it! It is time for America to move and to speak not with boasting and belligerence but with a quiet strength, to depend in world affairs not merely on the size of an arsenal but on the nobility of ideas, and to govern at home not by confusion and crisis but with grace and imagination and common sense. Too many have had to suffer at the hands of a political economic elite who have shaped decisions and never had to account for mistakes or to suffer from injustice. When unemployment prevails, they never stand in line looking for a job. Yes, and even more from another speech…. Each and every time, a new generation has risen up and done what’s needed to be done. Today we are called once more – and it is time for our generation to answer that call. For that is our unyielding faith – that in the face of impossible odds, people who love their country can change it. And as people have looked away in disillusionment and frustration, we know what’s filled the void. The cynics, and the lobbyists, and the special interests who’ve turned our government into a game only they can afford to play. They write the checks and you get stuck with the bills, they get the access while you get to write a letter, they think they own this government, but we’re here today to take it back. The time for that politics is over. It’s time to turn the page. This campaign must be the occasion, the vehicle, of your hopes, and your dreams. It will take your time, your energy, and your advice – to push us forward when we’re doing right, and to let us know when we’re not. This campaign has to be about reclaiming the meaning of citizenship, restoring our sense of common purpose, and realizing that few obstacles can withstand the power of millions of voices calling for change. By ourselves, this change will not happen. Divided, we are bound to fail. I find this particular political season both distasteful, as usual, dishonest, as usual, and quite annoying. Those who fail to fall into the marching orders of particular political parties are labeled as ‘nuts’ and ‘radicals’ while those who march in lockstep considered ‘pragmatic’ and ‘logical’; yet few see the futility we are engaged in. Ever since the FDR years, Americans have been trained like some sick, perverted, Pavlovian creature to respond to the dinner bell of government dominance in their lives and have abandoned the ideals of individualism and creative freedoms. The basic business concept of creative destruction which allowed our capitalist system to evolve and grow to incredible strength without the shackles or cooperation of government intervention have been forgotten ever since the days of Woodrow Wilson. Yet here we are again, almost one century later, willing to listen to and accept the mediocrity of the masses over the superiority of the individualism which made our nation great in an effort to stave off “suffering” and the necessary corrections of one half century of spending, waste and modified socialist Keynesian capitalism which would make Adam Smith spin in his grave like an out of control helicopter. Yet once again, in the words above, we here echoes. You would be partially correct. The words of “Change” have been echoed by numerous political candidates for election after election, yet there are few who grasp the impact of “change” in this environment. If this man becomes President, I fear our Republic will fall faster, not much faster than a McCain tenure mind you, but faster. You see, I have properly applied the title of “The Black Jimmy Carter” to Mr. Obama and not to demean him personally, but to make a point. A hollow suit is a hollow suit. Be it in the guise of a goober minded peanut farmer from Plains, Georgia or a Senator from Illinois who sees a chance to be the opportunist of the modern age. I’ve heard nothing “new” from either party for some twenty years now. I’ve heard nothing revolutionary other than that brief spurt of hope in the 1994 Republicans who instantly turned into Caligula’s play toys after obtaining money and power and all that is corrupted by it. Once again, at the most critical juncture in history, the American people are faced with four potential political candidates who could change history and none of them have the vision, the hope, or the ideals to save us. As such, I urge everyone, and I mean everyone, be they rich or poor, left or right, or apathetic to our political dilemma to prepare for the absolute worst. If Caligula’s wife becomes empress we will see a rapid acceleration to the end of Constitutional freedoms, thus why I call her “Mussolini in Drag.” If the BJC (Black Jimmy Carter) becomes the leader of the free world, the consequences of indecision and inexperience shall lead us to a destination which the Soviets could never have dreamed of in their wildest fantasies. And the two RINO’s will lead us into an economic black hole along with their internationalist intentions that creates a permanent caste system that stirs a rebellion unseen since the 1860’s due to their incompetent ideals. So prepare my friends. Everyone needs to do whatever it takes to get your personal affairs in order. This is not the time to be shy, hesitant nor to delay; get ready now. The worst is about to be upon us.